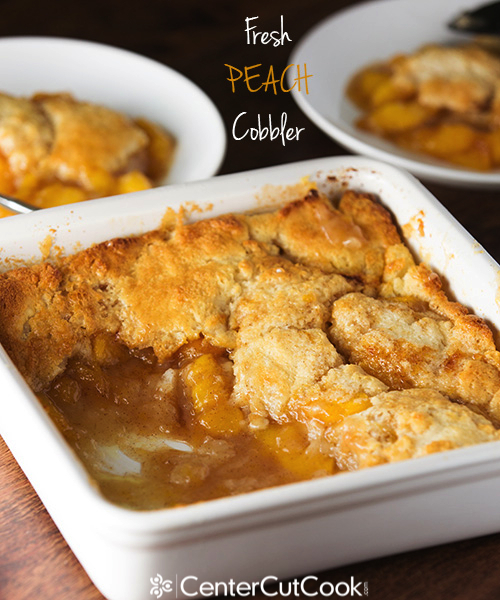 Fresh Peach Cobbler – This timeless summer dessert features fresh juicy peaches, hints of cinnamon, and a buttery light batter that is baked until golden brown and delicious! 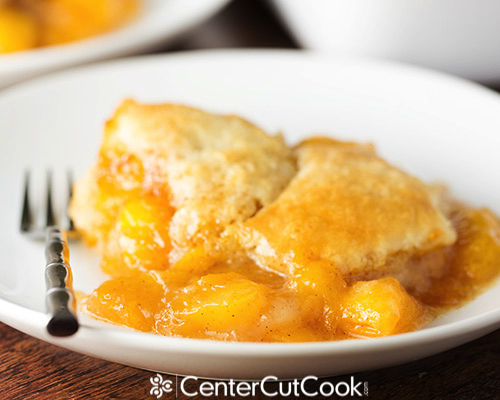 Peach Cobbler is one of those classic desserts that everyone has had at one time or another. With endless variations (I’m talkin’ peach, apple, blackberry, blueberry, mixed berry, raspberry, and on and on…) it’s no wonder that it’s such a hit! The first time I ever had Peach Cobbler was when I was a teenager attending a girl’s camp during the summer. We made it in a big dutch oven over the campfire and it was absolutely amazing. Ever since, I’ve been hooked! What’s interesting, however, is that depending on who you ask, cobbler is described differently. 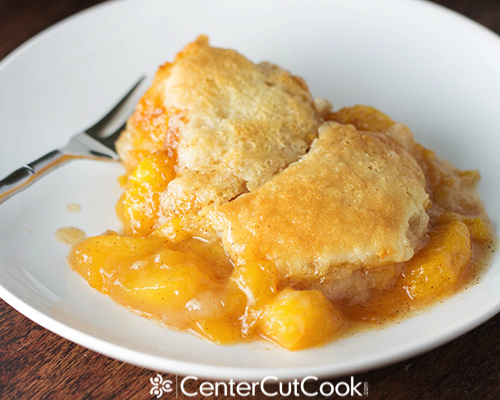 For some, cobbler is more like a pie, with a pie crust overtop the fruit. For others, it’s more like a biscuit that covers the fruity filling. For me? I’m more accustomed to topping the fruit with a batter which is what this recipe is all about. 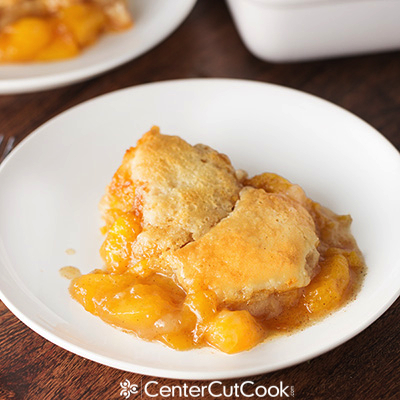 The crust on this Peach Cobbler recipe is just perfect! The outside is a bit crunchy while the inside is warm, and soft and gooey, just the way I like it. I’m always easily amused with cobblers in that the peaches get poured on top of the batter, yet during baking, the crust rises above the peaches. Am I the only one that finds this amusing? The peaches underneath that fabulous crust are juicy and sweet with hints of vanilla and cinnamon. Be sure you are using juicy, ripe peaches for the best peachy flavor. And remember to peel those peaches too! I don’t recommend making this with frozen peaches, or canned peaches, fresh peaches tend to provide the best result. Have I mentioned how easy this recipe is to make? There are some recipes that call for a box of cake mix to help speed the process along, but really, this comes together almost just as quick, yet the flavor is so impressive. And the ingredients it calls for are all ones you likely already have on hand. 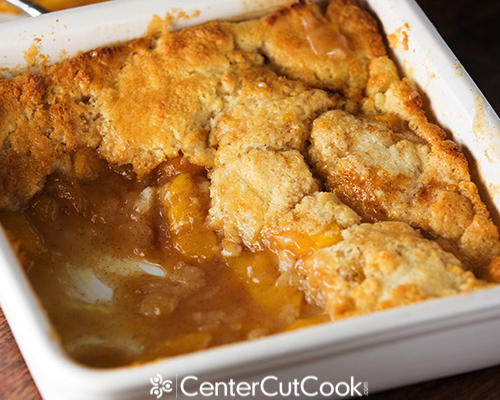 You know what’s even better than warm Fresh Peach Cobbler right out of the oven? Warm Fresh Peach Cobbler with a scoop of vanilla ice cream and a little whipped cream! Yum. If you don’t have peaches on hand, you can sub just about any ripe, delicious fruit you’d like! Note: I do not recommend using canned fruit. Also, a note about the sugar. if you’d like to cut back on the sugar, add 1/2 cup to the peaches instead of the suggested 1 cup. Or, you could change it up a bit and add 2/3 cup to the batter mixture and 2/3 cup to the peaches. I’ve tried all of these options and like them all. Pour melted butter in a 13 x 9 inch baking dish. In a medium sized bowl sift together 1 cup all-purpose flour, 1 cup sugar (reserve the other cup for the peaches), 1 tablespoon baking powder, and 1/4 teaspoon salt. Add in 1 cup milk and stir just until all ingredients are combined. Pour the batter over the butter. DO NOT STIR. In a large saucepan, combine sliced peaches, 1 cup sugar, 1 teaspoon vanilla, 1 tablespoon fresh lemon juice, and 1 teaspoon ground cinnamon. Bring this mixture to a boil, stirring constantly. Pour the peach mixture evenly over the batter. DO NOT STIR *Note: One option for modifying this recipe to make it less sweet is to use 1/2 cup of sugar here. Also, the order is correct. Butter, batter, peaches. During baking, the batter rises above the peaches! Bake for 40-45 minutes, or until the top is golden brown.